Background: The majority of naturally occurring compounds, pharmaceuticals, and drug-candidate molecules possess heterocyclic scaffolds. In this context, tetrahydobenzo[b]pyrans are of considerable importance. In the line with the synthesis of these valuable heterocyclic compounds, the researchers tried to synthesize these molecules using different organocatalysts. 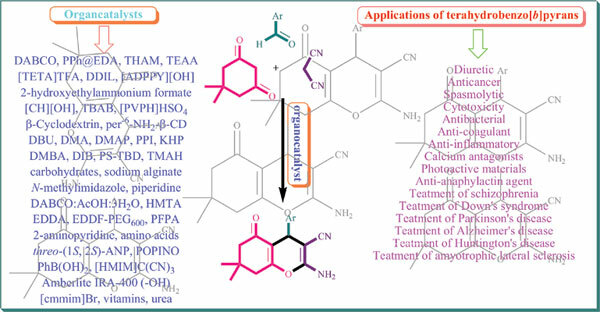 The development of new strategies for three-component condensation of dimedone, various aldehydes and malononitrile for construction of tetrahydrobenzo[b]pyrans is of particular interest to organic chemists and pharmacologists. Objective: In this review, three-component catalyzed synthesis of tetrahydrobenzo[b]pyran compounds is introduced, focusing on the developments in the use of organocatalysts. Organocatalytic approaches were investigated for the synthesis of tetrahydrobenzo[b]pyrans. This contribution covers the literature concerning the synthesis of heterocycles referred to, in recent times. Conclusion: This review article is associated with the study of the three-component synthesis of tetrahydrobenzo[b]pyrans using organocatalysts. This review also provides an insight into the importance of these heterocycles. In the vast majority of these reactions, water and water-ethanol system have been used as green solvent media for implementation of them. The use of green solvents, the development of less toxic and promising reagents/catalysts as well as the design of inexpensive and reliable approaches are some of the principles of green chemistry, and most of the methods are benefited from them. Tetrahydrobenzo[b]pyrans and organocatalysts open avenue ofnew horizons. The recyclability of the many of these organocatalysts offers an additional merit for the use of these catalysts in 3-CR of aldehydes, dimedone, and malononitrile reactions. Tetrahydrobenzo[b]pyrans, dimedone, arylaldehyde, malononitrile, green solvent, organocatalyst, three-component reaction.